MSAJ, which is designated as a performance evaluation organization by the Minister of Land, Infrastructure, Transport and Tourism (Designation No. : MLIT No. 25), started the performance evaluation service based on the Building Standards Act in February 2007. When an unorthodox verification method was used to verify that the construction or the construction material complies with the performance codes stipulated in the Building Standards Act, the Minister of Land, Infrastructure, Transport and Tourism (MLIT) certifies such construction or construction material in accordance with the provision set forth in Article 68-25 of the Act. The performance evaluation is used as the basis for this certification. Among the classifications mentioned in the items of Article 59 of the Ministerial Ordinance on the Official Qualification Examination for Building Standards Examiner Inspection Body Based on the Building Standards Act, we provide the following classifications of services. Performance evaluation on the structural safety of the membrane structure buildings with regard to the certification set forth in Article 20, paragraph (1), item (i) in the Building Standards Act. Performance evaluation on the architectural materials including the membrane materials, membrane materials for tent warehouses, etc., with regard to the certification set forth in Article 37, item (ii) of the Building Standards Act. Performance evaluation on the fire-resistance performance of the membrane structure buildings with regard to the certification set forth in Article 108-3, paragraph 1, item (ii) and paragraph (4) of the Order for Enforcement of the Building Standards Act. Performance evaluation on the evacuation safety performance of the membrane structure buildings with regard to the certification set forth in Article 129, paragraph 1 and Article 129-2, paragraph (1) of the Order for Enforcement of the Building Standards Act. *If the reference value for the material strength, etc. needs to be specified in the performance evaluation on the quality of the designated architectural material, MLIT specifies it. 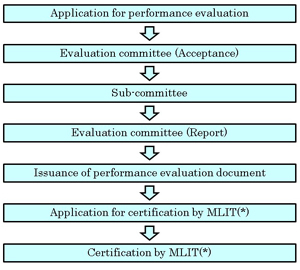 *The evaluation committee (acceptance) may be omitted depending on the contents of the application for evaluation.